We’d love your help. Let us know what’s wrong with this preview of Triple Jeopardy by Anne Perry. Daniel Pitt, along with his parents, Charlotte and Thomas, is delighted that his sister, Jemima, and her family have returned to London from the States for a visit. But the Pitts soo Young lawyer Daniel Pitt must defend a British diplomat accused of a theft that may cover up a deadly crime in this riveting novel from the New York Times bestselling author of Twenty-one Days. To ask other readers questions about Triple Jeopardy, please sign up. A simple, uncomplicated case of murder and courtroom drama this is not. But, then it never is with a writer who not only brings the past of, first Victorian, and now Edwardian London to life, but also brings the reader right inside the minds of the characters who people her stories. For those new to Anne Perry's books, Triple Jeopardy is the second of the Daniel Pitt stories. The Daniel Pitt stories are a follow up series to the Thomas and Charlotte Pitt series. Daniel is their son. He is a lawy A simple, uncomplicated case of murder and courtroom drama this is not. But, then it never is with a writer who not only brings the past of, first Victorian, and now Edwardian London to life, but also brings the reader right inside the minds of the characters who people her stories. For those new to Anne Perry's books, Triple Jeopardy is the second of the Daniel Pitt stories. The Daniel Pitt stories are a follow up series to the Thomas and Charlotte Pitt series. Daniel is their son. He is a lawyer unlike his dad who was a police detective and left the London force to rise through the rank in Special Branch to become its head. Because of the close tie of family and an assumed familiarity with all that came before, new readers should start with Thomas and Charlotte's stories before jumping into Daniel's. And, because they enter into this story, the novella, A New York Christmas, should be read first so the reader has the earlier part of Jemima and Patrick's story. Triple Jeopardy left me in knots so many times. I was so vested in the characters that I felt what they felt and, particularly, feared what they did. By the time I was done with this investigation and courtroom drama, I was still left with a great deal to unpack. The author tells a cunning murder mystery in a well drawn setting with complex characters and motives, but she's not afraid to ponder social mores and ideologies, too. Justice vs. Revenge, Truth vs. Expediency, A Woman's Reputation exposed to puerile gossip vs. allowing an injustice, and the biggie, presumed innocent until proven guilty, are just some of the major elements brought into play. So, the skinny on Triple Jeopardy is that young, junior lawyer, Daniel Pitt, gets sideswiped when during her first visit home from America, his sister, Jemima and her husband, Patrick, approach him with a nearly impossible request. A dear friend was assaulted in her own home back in DC and the man who did it is now back in London after claiming diplomatic immunity. They want to get him on a different charge because surely a man that would attack a woman has done other crimes and, if possible, get the other brought into it. Daniel isn't emotionally involved like his sister and brother in law who he doesn't want to disappoint, but he is uneasy. They are trusting the word of others and he is trusting their word. The actual facts are few, but hearsay is rife. And, things that stack up against Phillip Sydney very neatly. And, yet, a young woman is not faking the assault which really happened and her father swears he saw the man's face clearly before he got away. Daniel wants to help his sister and her husband get justice for their friend, but he believes that there is something else behind it all. Daniel is up against powerful people and maybe his own family, but it sure was great seeing him work through all that with the help of Kitteridge, his wry senior partner, the colorful and not always lawful Rowan Blackwood, and the redoubtable criminal pathologist Miriam fford Croft. Though I felt Jemima and Patrick put Daniel on the spot, I did love that I got to follow up with them after all this time. I always wondered how Jemima and her Irish-American copper were faring. Miriam and Daniel's interactions are my favorite as there is the low level buzz of attraction with the slight taboo that he is over ten years (maybe even fifteen) her junior. This was one where I knew exactly who the bad guys were as soon as most of the players were introduced and I even got the general idea of why things were set up the way they were. But, that said, there were a lot of coloring in that I needed to get a better picture so it made more sense for the why behind this villain. In the end, I still had some questions that I didn't think got fully answered like the German angle and how the villain was connected there. Maybe I missed it and will need to go back and look closely. But, beyond that I wanted to know the ramifications for what came now that the truth was out. It ended abruptly with not much of a denouement. All in all, it was a gently-paced character driven plot with spikes of intrigue and excitement. It was a nice blend of historical setting and courtroom drama. I can't wait for more of Daniel and the others solving mysteries and bringing the answers to the courtroom. This is definitely a series for the historical mystery fan. The year is 1910 and young barrister Daniel Pitt is anxious as he steps into Sir Thomas Pitt's home. It's not his parents who have him on tenterhooks but rather the return to England of his older sister who had married an American and now makes her home in Washington, D.C. Daniel and his sister, Jemima, were once very close in his youth and now, after all this time, he's not sure what to expect. It's been four years since last they saw each other. And on top of that, she has brought her husband The year is 1910 and young barrister Daniel Pitt is anxious as he steps into Sir Thomas Pitt's home. It's not his parents who have him on tenterhooks but rather the return to England of his older sister who had married an American and now makes her home in Washington, D.C. Daniel and his sister, Jemima, were once very close in his youth and now, after all this time, he's not sure what to expect. It's been four years since last they saw each other. And on top of that, she has brought her husband Patrick and two daughters Sophie and Cassie with her - all people unknown to Daniel. After the ice is broken they all settle into congenial conversation. As it turns out, Jemima's and Patrick's visit is not solely a social one. Patrick takes Daniel aside and shares with him a story of great injustice and implores Daniel to help balance the scales. A month or so ago, Jemima's dear and rather well off friend, Rebecca Thorwood, had been assaulted in the middle of the night while in bed and a beloved pendant, and gift from her godmother, was ripped from her neck causing cuts to her throat. Rebecca's father swears that he recognized the assailant as British diplomat Philip Sidney, who presumably fled to the embassy and claimed diplomatic immunity. Sidney soon is dispatched back to London by a superior for Sidney's own safety. Then it comes to light that Sidney was skimming a bit off the books at the embassy and now finds himself arrested and subjected to the British court system. Patrick implores Daniel to find a way to shed light on the additional wrongs suffered at the hands of Mr. Sidney as a way of getting justice for Rebecca. Sure enough, Daniel ends up defending the scoundrel. As more and more evidence comes to light, nothing is as it originally seemed. So who really is telling tales and who's telling the truth. With the assistance of Miss Miriam fford Croft, Daniel's boss' daughter and a highly learned and skilled physician, Daniel seeks the evidence needed to bring the truth to light. Although this is the second installment in the Daniel Pitt mystery series, the book stands well enough on its own. The characters are well developed and the reader quickly gets a strong sense of each character's nature, knowledge and passion. The story is a bit non-orthodox police procedural and courtroom drama with sweet family relations thrown in for the personal touch. There's definitely a bit of chemistry between Daniel and Miss Miriam fford Croft. Daniel admires her tremendously and may be a bit intimidated by her. But one thing he knows for certain about her, she is confident, capable and exceedingly bright. She's definitely someone you want in your court. I have enjoyed both books in this series spun off from the Thomas and Charlotte Pitt mystery series and no doubt, I will continue with it. If historical fiction with a touch of mystery and courtroom drama appeals then this could well be a book for you too. Triple Jeopardy is the second Daniel Pitt book by Anne Perry, and it’s a worthy successor to the first. Daniel’s sister and her husband, visiting from Washington DC relate a horrible story; a British diplomat has committed a sexual assault and robbery on a young girl, even to the point of doing so in her bedroom -- in America. The man has grabbed a necklace, claimed diplomatic immunity, and fled home to England. So far he’s escaped justice. They want Daniel Pitt’s help to do something about this. Triple Jeopardy is the second Daniel Pitt book by Anne Perry, and it’s a worthy successor to the first. Daniel’s sister and her husband, visiting from Washington DC relate a horrible story; a British diplomat has committed a sexual assault and robbery on a young girl, even to the point of doing so in her bedroom -- in America. The man has grabbed a necklace, claimed diplomatic immunity, and fled home to England. So far he’s escaped justice. They want Daniel Pitt’s help to do something about this. Daniel commits himself immediately, which he will probably live to regret, no doubt. Daniel’s sister presents an important point -- that it’s Rebecca Thorwood’s word against the man, Philip Sidney. Will the young woman be willing to go public, to face the possible humiliation, if it should get to that point? And of course, behind it all is the feeling that what everyone will think is that she isn’t an innocent victim – that she let Sidney in, tempted him to attack her – “didn’t say no.” How modern this all sounds! And it may create an international incident – in that the Americans (Rebecca’s family) believe that the British won’t see justice done, as Sidney is a British citizen. What must happen, then, is justice obtained obliquely. Luckily, Sidney has been arrested for embezzlement, and the evidence seems overwhelming. Daniel, through his law firm, fford Croft and Gibson, will serve as counsel for the defense. But perhaps, he will not try too hard? Will his moral compass be jeopardized? Readers will see. At first, Daniel and we readers are outraged. A bounder, Sidney has to be. And embezzling from the embassy, to add to it. And yet... Daniel meets the fellow, who swears he has done neither crime, that he is being framed for something he didn’t do. And slowly, slowly, with the help of Miriam fford Croft, friend and frustrated scientist, Daniel begins to believe his client. “Something bigger here than we have realized and a great deal uglier.” And the truth of this is more than anyone could possibly have imagined, at the beginning. There are answers to be found in the death of family far away – the catalyst for everything. Because of a house. Anne Perry is a master plotter -- Triple Jeopardy is a tour de force in that regard. Perry relates Daniel’s thoughts on all this – there is nothing subtle about it – her skill asserts itself in that his desire to know the truth is something the reader needs to know, too, especially as one delves further and further into the story. The book finishes up in an exciting fashion, and we are reminded that Daniel is rather a praiseworthy lawyer. For all that is good about this book, however, the ending is much, much too abrupt. For all we have learned about these people, with all the thoughts and opinions and soul searching and recriminations -- and that’s just the good guys -- that ending is rather melodramatic and abrupt; a minor quibble. The story line presages things to come, in British history. It’ll be interesting to see how Ms. Perry handles Daniel’s future. A slow beginning opening with a Pitt family reunion. Daniel's sister Jemima, her husband Patrick and their two lovely children having come from Washington D.C. to England for a visit. A visit that coincides with the charge of embezzlement for a young English diplomat, Philip Sidney, who had fled Washington claiming diplomatic immunity against a more serious charge, the attack and theft from a young woman Miss Rebecca Thorwood whilst she was sleeping. Rebecca is a friend of Je Stunning revelation! Disgusted by the cowardly Sidney staining the reputation of the Foreign Office, Daniel intends to help his brother-in-law seek justice for Rebecca. However as he becomes more familiar with the case he realizes that things just don't fit together. He also questions his own actions if he doesn't give his client a determined defense. The climax is just that! Surprisingly brief and fittingly concluded. I did not see it coming although with hindsight there were clues along the way. I must admit from the measured start I wondered where things were going. By the end I was deeply immersed in not only Daniel's stunning court case resolution, but his relationship with his family and various friends. I was charmed by the whisper of his feelings for Miriam, the slight moments of awareness between the two, quickly dispatched. Which is ridiculous as Miriam is much older than Daniel and "she must look at him as if he were a boy". Mmm?! I found the mystery in this second installment of the Daniel Pitt series to be interesting and puzzling. I had an idea of what the solution might involve, but I was wrong. It did wrap up with a bang and minimal explanation, which made me felt that all that had gone before could have been abbreviated to match the compactness of the finale. Overall, I like the main character. He is pleasant and not overconfident as he learns the ropes of his legal profession. I also enjoyed the reappearance of Miri I found the mystery in this second installment of the Daniel Pitt series to be interesting and puzzling. I had an idea of what the solution might involve, but I was wrong. It did wrap up with a bang and minimal explanation, which made me felt that all that had gone before could have been abbreviated to match the compactness of the finale. Overall, I like the main character. He is pleasant and not overconfident as he learns the ropes of his legal profession. I also enjoyed the reappearance of Miriam fford Croft, 40-year-old doctor and pathologist who is not allowed to practice because she is a woman. Her explanation of forged vs. legitimate handwriting was very interesting. She is a well-written blend of mostly capable and slightly vulnerable, and it raises intriguing questions for the reader about where her relationship with the much younger Daniel Pitt is heading. The thing that prevents me from rating it higher is the unnaturalness of the characters' speech and interaction. They are all extremely eloquent and long-windedly introspective, and they seem to read each other's minds with exceptional accuracy. Indeed, one wonders why speech is necessary at all for them, because it would seem they could carry on entire dialogues by merely interpreting each other's posture and raised eyebrows. This is the second installment of the new Daniel Pitt series, the son of Thomas and Charlotte Pitt. I really like this character and find him quite refreshing. He's a new lawyer just getting his bearings and is likable. This one features his sister, Jemima, returning home from America for a visit with her new husband and two young daughters. Her new husband is a policeman who seeks Daniel's help in a case. The case is so convoluted and silly that I almost stopped reading it. I am glad I continu This is the second installment of the new Daniel Pitt series, the son of Thomas and Charlotte Pitt. I really like this character and find him quite refreshing. He's a new lawyer just getting his bearings and is likable. This one features his sister, Jemima, returning home from America for a visit with her new husband and two young daughters. Her new husband is a policeman who seeks Daniel's help in a case. The case is so convoluted and silly that I almost stopped reading it. I am glad I continued because the ending was decent and tied things up nicely. I like the new characters introduced in this series including Miriam Blackwood, the female forensic scientist. There's a lot to like about this new series but the terrible plot almost did it in. It worked itself out before the ending but still a good copy editor could have made it better from the beginning. I will continue to read the series but I have my fingers crossed the next one has a better plot and a copy editor. Anne Perry is a master storyteller and this new series just adds to her legend. I have followed and loved the Charlotte and Thomas Pitt series from the beginning and to now have their son Daniel with his own series is delightful. The first book in the series, Twenty-One Days, was an outstanding read and a great introduction to this new series. In this book, we find recurring characters from the first book – and I hope they will be recurring characters throughout the series because I liked them all very well. I particularly like Miriam Fford Croft who is an anomaly for her time – she is brilliant and has studied forensic sciences and has passed all of the tests to become a doctor, but she can’t be a doctor because she is a female. I also think she might turn out to be Daniel’s love interest even though she is 15 years older than him – he’s twenty-five and she is soon to be forty. Daniel is so excited! His sister Jemima is visiting from America with her husband and their two daughters. Daniel has never met her husband nor her daughters and he’s so excited to meet them – especially his nieces. He’s also apprehensive because he hasn’t seen Jemima in four years and he wonders if she has changed. They were so close growing up and he doesn’t want to lose that even though they live on different continents. Her husband is an Irish-American police detective named Patrick Flannery. When Daniel first meets Patrick, he has quite a story to tell Daniel and he asks Daniel for his help. Daniel is a very honorable, honest and upstanding young man (just like his dad) who has devoted his life to the justice system and he is outraged and angry at the tale Patrick has told him. A diplomat from the British Embassy in Washington DC broke into the home of a prominent American citizen, he assaulted (not raped) the daughter of the home in her bedroom and snatched a necklace from her neck and made his escape – but not before her father saw and recognized him. That same diplomat claimed diplomatic immunity and immediately returned to London. Daniel is outraged at this miscarriage of justice and wonders how he can help bring the blackguard to justice. Soon, the method presents itself and Daniel is prepared to leap in, but then, he meets the young man and starts to wonder if he knows all he needs to know about the case. Patrick is adamant that the young man is guilty, Jemima is torn, and Daniel just doesn’t know. As Daniel digs, he comes to believe there is a bigger, darker secret yet to be uncovered. That doesn’t mean the man isn’t guilty – it just means there is more to know. Daniel investigates and more and more things seem – just – wrong – not quite adding up. He asks his friend Roman Blackwell (from book one) to learn what he can of the young man and then later he brings Miriam in to do some forensic work. They all uncover more and more information that makes Daniel believe he’s in a bed of quicksand – a bottomless pool of secrets. The ending is quick, short and unexpected. Maybe a bit too abrupt for my liking. I thought that some leaps of logic that Miriam made were more like leaping canyons rather than fissures and I didn’t see anything presented at that point that would actually justify that leap. Then, once that leap was made, we didn’t see the evidence until Daniel presented it. I would have liked to see more of that investigation and how they got there. This is a delightful read and I absolutely LOVED that Charlotte and Thomas Pitt made appearances. I don’t think you’ll be disappointed if you give the book a try! I’m a fan of Anne Perry, and this book is up to her usual standards. I’ll note that many of the more glowing reviews are from readers of free copies from Net Galley or the publisher, and I’m beginning to become suspicious of the waves of four- and five-star ratings that typically emerge from reading for free. Kind of like I’m becoming suspicious of the four- and five-star reviews of “free” self-published books. I’m beginning to wonder if the reader not having any financial skin in the game unint I’m a fan of Anne Perry, and this book is up to her usual standards. I’ll note that many of the more glowing reviews are from readers of free copies from Net Galley or the publisher, and I’m beginning to become suspicious of the waves of four- and five-star ratings that typically emerge from reading for free. Kind of like I’m becoming suspicious of the four- and five-star reviews of “free” self-published books. I’m beginning to wonder if the reader not having any financial skin in the game unintentionally taints his or her review. Hmmmm. Nonetheless, I didn’t engage with Triple Jeopardy easily, and I think my distance had to do with a few of the characters, the stereotypic treatment of ethnicities, and a really looping plot line. (I realize that stereotypes usually develop from facts and behavior, but that doesn’t mean I enjoy reading stereotypes.) I particularly had trouble with Daniel Pitt’s sister and brother-in-law, both their wobbly and seemingly shallow relationship, and the brother-in-law’s acerbic and erratic character in particular. Also, although I realize that Perry has spun Daniel Pitt off from his father, I do miss the elder Pitt’s wisdom and gravitas, as well as the empathy and humor of Daniel’s mom, Charlotte. Triple Jeopardy is the second book in the Daniel Pitt series. Thomas and Charlotte Pitts children are grown and are out facing their own careers. Daniel Pitt has finished his education and is now a practicing lawyer. His father, Thomas Pitt would rather have seen Daniel follow him as a policeman, but is determined not to interfere with any cases Daniel might have unless Daniel was to ask for his help. Daniel’s sister Jemima has moved to America and has married Patrick Flannery, a Washington D.C. Triple Jeopardy is the second book in the Daniel Pitt series. Thomas and Charlotte Pitts children are grown and are out facing their own careers. Daniel Pitt has finished his education and is now a practicing lawyer. His father, Thomas Pitt would rather have seen Daniel follow him as a policeman, but is determined not to interfere with any cases Daniel might have unless Daniel was to ask for his help. Daniel’s sister Jemima has moved to America and has married Patrick Flannery, a Washington D.C. policeman. Jemima and Patrick have returned to England with there two daughters to visit with the family. Patrick presents to Daniel a case he was working on where a friend of theirs was attacked in her home and had a reportedly valuable necklace stolen. The victims’ parents were able to identify the thief, Sidney, as a member of the British Embassy. The embassy claims diplomatic immunity and sends him back to England. Shortly after arriving back home he is charged with embezzling 100 pounds from the embassy. Patrick wants Daniel to defend Sidney on the embezzling charge with the hope of introducing the assault and theft charge from the U.S. He agrees to represent Sidney, but the more he gets into the case, he not sure where he will find the one piece of information that will support his client. The last thing he wants to do is bring in the head of the Special Branch, his father Sir Thomas Pitt. In the end, Miriam Croft, a doctor, and pathologist comes to the rescue once again. As always, Anne Perry provides the reader with an exciting, well-plotted story. She also provides the reader with an interesting and believable cast of characters. When new lawyer Daniel Pitt meets his sister’s husband for the first time, Patrick asks him for help with a case. Daniel’s sister Jemima and her husband are friends with a young woman who was attacked in her own bedroom in Washington, DC. The woman’s dad has identified a British diplomat as the attacker, but the man claims diplomatic immunity and returns to London. Patrick and the young woman’s influential family have a plan to get justice for their daughter, but need Daniel’s help. Daniel agree When new lawyer Daniel Pitt meets his sister’s husband for the first time, Patrick asks him for help with a case. Daniel’s sister Jemima and her husband are friends with a young woman who was attacked in her own bedroom in Washington, DC. The woman’s dad has identified a British diplomat as the attacker, but the man claims diplomatic immunity and returns to London. Patrick and the young woman’s influential family have a plan to get justice for their daughter, but need Daniel’s help. Daniel agrees to help, but then worries he may be in over his head. This book is set in London in 1910. Daniel Pitt is the son of Thomas and Charlotte Pitt, who were the main characters in another of Anne Perry’s mystery series. This series continues the Thomas Pitt series in some ways, but Daniel is the now the main character. Thomas and Charlotte make appearances and Thomas plays an important role in this book. It’s not necessary to have read the prior books, but longtime readers like me will enjoy catching up with the elder Pitts and getting to know Daniel and his sister Jemima. Jemima plays a large part in this story and she has grown up to be an intelligent, independent, and outspoken woman. She works well with Daniel, who is also intelligent and is eager to do a good job in his new career. The case is much more complex than it looks and Daniel doesn’t know who to believe or who he can trust. At times, he even has doubts about his brother-in-law which saddens him to think he could damage the relationship between him and his sister. Daniel, Jemima, and Patrick all want to do the right thing, but often have different ideas about how to do that. The solution is something none of the three could have imagined. I was surprised by the dramatic ending when the motive was revealed. The book does a good job of building the suspense over what the truth really is, so much so that the middle part of the story moves a little slowly. However, the story picks up and gets really good. Unfortunately, it ends rather abruptly. I think if there had been one more chapter to wrap things up and show the aftermath, the ending would have been much more satisfying. I still enjoyed the book and am interested in seeing what is in store for Daniel in future books. Perry's writing is so familiar to me, as are the Pitt family, that I feel I'm catching up with friends. As Daniel is a barrister she'll have some plot turns to attend to to get him involved as he seems set to carry the mantle for the mystery solving Pitts. But she does have a way with a story. Triple Jeopardy is the second book in Anne Perry’s Daniel Pitt series, a spin off from her popular Charlotte and Thomas Pitt series. Fans of Charlotte and Thomas will be happy to hear that they make several appearances during their son’s investigation, which also involves his sister Jemima and her American husband Patrick, who has persuaded Daniel to take on the case of an English diplomat accused of assaulting an American woman in Washington, DC. I hadn’t read either of these series before, and Triple Jeopardy is the second book in Anne Perry’s Daniel Pitt series, a spin off from her popular Charlotte and Thomas Pitt series. Fans of Charlotte and Thomas will be happy to hear that they make several appearances during their son’s investigation, which also involves his sister Jemima and her American husband Patrick, who has persuaded Daniel to take on the case of an English diplomat accused of assaulting an American woman in Washington, DC. I hadn’t read either of these series before, and was able to jump right in with this one (although Daniel’s first case was referenced often enough in this book to seem like a marketing ploy). There’s a lot to like about this series: the Edwardian England setting, the interesting supporting characters (particularly his law colleague Kitteridge) and Pitt family dynamics, and a promising love interest angle with Miriam ford Croft, a pathologist who occasionally helps out with the forensic side of Daniel’s cases. My only quibble is with the slow pacing in the middle of the book, particularly compared with the speed—almost abruptness—of the ending, but this is a minor issue and one that won’t stop me from coming back for more of this enjoyable series. I'm an avid reader, yet somehow had never read anything by Anne Perry. I'd seen her name, but not sampled. Thanks to NetGalley for the opportunity to read and review this book! I had no foreknowledge of the characters who may be familiar to followers of her oeuvre. Nonetheless, plenty of details helped me grasp their roles and relationships. There's no need to read her series in order. I had less ease keeping myself in the time period, though. Triple Jeopardy is a tale of internal and external co I'm an avid reader, yet somehow had never read anything by Anne Perry. I'd seen her name, but not sampled. Thanks to NetGalley for the opportunity to read and review this book! Triple Jeopardy is a tale of internal and external conflicts. The main character, Daniel, a relatively new barrister, struggles with everyone's motives, not just with those directly involved in the defense case he is handling. I was overwhelmed by the convoluted details, but so was Daniel. As things became clearer to him, they became clearer to me. Part of what makes a good detective story is misdirected suspicion. Daniel doubted almost everyone at some point or other, but isn't that necessary to avoid getting trapped in your own assumptions? Like a good scientist, a detective must be a skeptic and view the evidence from many perspectives, all the while not assuming that all the evidence is in. Seems like a good reminder for us all. Triple Jeopardy is an enjoyable read. I cared about the outcome of the case and the characters' developing relationships. Anne Perry’s second Daniel Pitt novel is another winner. Perry writes atmospheric historic novels, and this new series, a spin off of her popular Charlotte and Thomas Pitt series, is set to continue to delight fans. Daniel Pitt, a young lawyer, is maneuvered into defending a disgraced member of the British consulate in Washington, D.C., sent home because of alleged misbehavior in the United States. 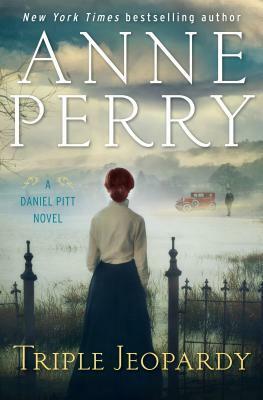 The entire Pitt family, as well as several members of Daniel’s law practice become involved in inve Anne Perry’s second Daniel Pitt novel is another winner. Perry writes atmospheric historic novels, and this new series, a spin off of her popular Charlotte and Thomas Pitt series, is set to continue to delight fans. Daniel Pitt, a young lawyer, is maneuvered into defending a disgraced member of the British consulate in Washington, D.C., sent home because of alleged misbehavior in the United States. The entire Pitt family, as well as several members of Daniel’s law practice become involved in investigating the complicated affair. I was surprised by the last minute plot twist that revealed a satisfying solution to the puzzle. Triple Jeopardy is the second installment from the Daniel Pitt series. I liked it and hope to catch up on the series by reading book one, Twenty-One Days. Four stars. What a terrific read. Highly recommended. Thomas Pitt, the London police officer who was the subject of Ann Perry’s first series, is now the head of the Special Branch, an elite force that tackles British national security. His son Daniel is an attorney and works for a small prestigious law firm. This is the second book in Anne Perry’s newest series about the adventures of Daniel Pitt and takes place in the early 20th century London leading up to WWI. Daniel Pitt visited his parents, Charlotte and Thomas Pitt’s home to see his sister Je Thomas Pitt, the London police officer who was the subject of Ann Perry’s first series, is now the head of the Special Branch, an elite force that tackles British national security. His son Daniel is an attorney and works for a small prestigious law firm. This is the second book in Anne Perry’s newest series about the adventures of Daniel Pitt and takes place in the early 20th century London leading up to WWI. Daniel Pitt visited his parents, Charlotte and Thomas Pitt’s home to see his sister Jemima and her family. Jemima had left England for the New York 4 years before. There she had met and fallen in love with a policeman, Patrick Flannery. A few years later, they moved to Washington, DC where Patrick continued to work as a police officer. Now she and Patrick and their 2 children have come back to London for a vacation. Patrick told Daniel about a case involving the Thornwoods, an influential family that he worked with in Washington. Rebecca Thornwood, an only child, had been attacked by an assailant in her Washington bedroom. A necklace with sentimental value was ripped from her throat and the assailant fled. Her father claimed that he saw the assailant and it was Philip Sydney, a junior foreign service employee at the British embassy in Washington. This book was provided by Net Galley and the publisher in exchange for an honest review. In an effort to keep the incident quiet and avoid prosecution, Sydney used his diplomatic immunity and quickly departed by ship for England. However shortly after he arrived back in England, he was charged with pilfering a small sum of money from the embassy. Sydney proclaimed his innocence. However Patrick asked Daniel to defend the man in court in hopes that the case would also expose the allegations of the break-in at the Thornwood’s Washington home. Daniel and his boss, Kitteridge, started to defend Sydney and Daniel learned that some of the receipts that Sydney is alleged to have used to steal were forgeries. So Daniel decided to find out why Sydney was falsely accused and who wants him in prison. Anne Perry takes her Charlotte and Thomas Pitt series to the next generation in Triple Jeopardy. Their son Daniel has had some success as a young lawyer, but he has been handed a case that could damage his career. Daniel’s brother-in-law Patrick is a policeman in Washington DC.on a family visit to London he approaches Daniel with the story of a British diplomat who was involved in an assault and the theft of a necklace. Claiming diplomatic immunity, he quickly fled back to England. While he may Anne Perry takes her Charlotte and Thomas Pitt series to the next generation in Triple Jeopardy. Their son Daniel has had some success as a young lawyer, but he has been handed a case that could damage his career. Daniel’s brother-in-law Patrick is a policeman in Washington DC.on a family visit to London he approaches Daniel with the story of a British diplomat who was involved in an assault and the theft of a necklace. Claiming diplomatic immunity, he quickly fled back to England. While he may have escaped punishment in the US, he has now been arrested for embezzlement from the Embassy.. Daniel is asked to defend him and possibly find a way to introduce his actions in America so that justice is served. After meeting with his client, Daniel questions the charges against him and begins an investigation of his own. The amount embezzled is not significant and rather than asking for repayment and dismissing him, a trial could put a black mark on the diplomatic service. Although Patrick is now family, Daniel is not well acquainted with him and suspects that he may have been involved in providing the evidence. His client’s supposed victim and her family hav also arrived in London after the death of a relative and prove to b less than reliable witnesses. Daniel calls on Mariam fford Croft, a forensic scientist, to examine the evidence and discovers additional irregularities. Their investigation leads them to the Channel Islands and the discovery of a related crime that has national implications. Perry ties each event together in a dramatic courtroom finale. While Charlotte and Thomas Pitt are supportive of their children, this is Daniel’s story. As he begins his investigation he is unsure of his client and his ability to represent him. With Miriam’s assistance he seems to find his way and his confidence grows. As he provides his final argument in court , Perry provides courtroom drama at its’ best. When a favorite author has a long running series and decides to do a spin off or two, too often those new series are not as good as the first one. Such is not the case with Anne Perry and the mysteries that have grown from the Thomas and Charlotte Pitt series. Their two children are now adults and Daniel has a series of his own. He shines in it. As a barrister he is very new to his profession but it fits him. It's now 1910 and Daniel is presented with a request from his brother-in-law, newly arri When a favorite author has a long running series and decides to do a spin off or two, too often those new series are not as good as the first one. Such is not the case with Anne Perry and the mysteries that have grown from the Thomas and Charlotte Pitt series. Their two children are now adults and Daniel has a series of his own. He shines in it. As a barrister he is very new to his profession but it fits him. It's now 1910 and Daniel is presented with a request from his brother-in-law, newly arrived from America, accompanied by Daniel's older sister, Jemima and their two little girls. A British diplomat, Phillip Sydney, has, it seems, gotten away with a nasty assault on a woman and a theft is involved. As the woman is a friend of his, Jemima's husband wants him to pay for what he did. Before anything can be done, he does a runner via the British embassy and flees to London. As a policeman, his brother-in-law is willing to go to great lengths to see justice done even if double jeopardy is in play. As the mystery unfolds, Daniel suspects that things are not as they seem and soon he is defending Sydney. There are some very powerful people working in the shadows and Daniel, along with a great cast of characters within his legal circle - his partner, Kitteridge, the very talented pathologist, Miriam fford Croft and Rowan Blackwood - are up to the challenge of seeing that justice is done. If you are a fan of Murdoch you will enjoy the forensics employed by Daniel and Miriam. As always, the descriptions of time and place are vivid and the historical details are very well researched. I have read every book in each series so I have all of the back story to add to my reading pleasure but, if you are new to Daniel's series, have no fear, Triple Jeopardy can stand alone. But be prepared to get your hands on the previous book, Twenty-One Days and settle down to another great mystery. When Daniel Pitt's sister Jemima returns to England on a visit from the States, her policeman husband Patrick has a perplexing proposition. He asks Daniel to defend a British diplomat on a minor charge of embezzlement to ensure that the man's real crime of assault (for which he has diplomatic immunity since it was perpetrated in the U.S.) comes out in court. Torn between eagerness to side with family and desire to uncover the truth, Daniel must risk his reputation as a lawyer on a long chance. I When Daniel Pitt's sister Jemima returns to England on a visit from the States, her policeman husband Patrick has a perplexing proposition. He asks Daniel to defend a British diplomat on a minor charge of embezzlement to ensure that the man's real crime of assault (for which he has diplomatic immunity since it was perpetrated in the U.S.) comes out in court. Torn between eagerness to side with family and desire to uncover the truth, Daniel must risk his reputation as a lawyer on a long chance. In the end, there is far more to the case than a diplomat diverting funds. Both the unity of the Pitt family and the fate of the nation hang on Daniel's ability to piece together the evidence. The second book in the Daniel Pitt series, this story continues Daniel's career as an up-and-coming lawyer. Whereas his father's reputation was on the line in the previous book, now it is Daniel's relationship with his sister. The case against diplomat Philip Sydney smacks of evidence-tampering. But if brother-in-law Patrick is mixed up in doctoring the embezzlement charges, how can Daniel make that public without estranging Jemima forever? Although the actual stakes of the case were high, the story seemed to have a slow pace. Little vignettes of Thomas and Charlotte Pitt playing with their grandchildren, reminiscences of Daniel and Jemima over their childhood, and tales about the original Renaissance figure Philip Sidney pepper the narrative. The overarching story of the series continued apace, however, and Daniel's partnership with fellow lawyer Kitteridge and romantic interest in forensic specialist Miriam developed satisfactorily. All in all, it was an interesting blend of a cozy family mystery and an international espionage thriller. I'm looking forward to the third book in the series. Triple Jeopardy by Anne Perry is the second in the new Daniel Pitt series: a second-generation series following the Thomas and Charlotte Pitt series. For every read there are a few authors/books that are touchstones for the reader, a place to bring us back to our center. Anne Perry is that for me. For all the varied reading I do, an Anne Perry novel is like coming home. There is always a moral challenge, maybe several; there is plenty of familial love and support; and there is an interesting mys Triple Jeopardy by Anne Perry is the second in the new Daniel Pitt series: a second-generation series following the Thomas and Charlotte Pitt series. For every read there are a few authors/books that are touchstones for the reader, a place to bring us back to our center. Anne Perry is that for me. For all the varied reading I do, an Anne Perry novel is like coming home. There is always a moral challenge, maybe several; there is plenty of familial love and support; and there is an interesting mystery. There is a resolution. The language is a little more formal, yet not out of reach. The story is stressful and compelling and the characters are interesting: especially Daniel and his friend Miriam. I recommend this Triple Jeopardy although I am a huge fan of reading a series in order so start at the beginning. In this story, Daniel's sister, Jemima and her husband, Patrick, and their two young daughters are on holiday in England (they live in the United States where Patrick is a police officer in Washington DC). Daniel is happy Jemima is home and takes immediately to her older daughter, Cassie. He likes Patrick and can immediately see how much he loves Jemima so all is good. Until Patrick brings him a crime that happened in Washington but the perpetrator used diplomatic immunity to flee to England. Patrick would like to see what could be done to right this wrong. Can Daniel do this without ruining his career? This review has been hidden because it contains spoilers. To view it, click here. Really enjoyed this book. Jemima with her husband Patrick, is home from America for a visit and they want Daniel's help in seeing that Philip Sidney is punished for attacking Rebecca Thorwood in America, but did he? And since he claimed diplomatic immunity how can they bring him to justice. When Sidney is charged with embezzling funds from the embassy Daniel has the unenviable job of defending him. But Daniel soon comes to believe that Philip Sidney is innocent of the crimes he is accused of. But Really enjoyed this book. Jemima with her husband Patrick, is home from America for a visit and they want Daniel's help in seeing that Philip Sidney is punished for attacking Rebecca Thorwood in America, but did he? And since he claimed diplomatic immunity how can they bring him to justice. When Sidney is charged with embezzling funds from the embassy Daniel has the unenviable job of defending him. But Daniel soon comes to believe that Philip Sidney is innocent of the crimes he is accused of. But who wants to destroy Philip Sidney's credibility and why? After questioning Rebecca it soon becomes apparent that her family is lying. Rebecca never recognized her attacker and her Father who claims he recognized Philip Sidney in the hall, wasn't actually there it was his wife who actually saw the "attacker" and claimed it was Sidney. With Miriam's help Daniel is able to prove that Sidney's signature was forged on many of the documents that supposedly proved the embezzlement at the embassy, but again why pin the embezzlement of petty cash on Sidney. What does he know that is a danger to someone. The second Daniel Pitt novel in the new series from Anne Perry. This novel follows almost directly on from the first story with Thomas Pitt's youngest child - now a young man and qualified lawyer/barrister of 25 - ~Daniel, seeking the truth in a very messy case. Like his parents, Daniel seems to revel in a complicated case full of red herrings of motives and side lines of confusion! Jemima, Daniel's sister, visits from her new home in Washington, with her husband and their two small daughter's. Dan The second Daniel Pitt novel in the new series from Anne Perry. Jemima, Daniel's sister, visits from her new home in Washington, with her husband and their two small daughter's. Daniel's new brother in law inveigles with a case involving a young diplomat who allegedly attacked and robbed a young woman in Washington then fled under diplomatic immunity. The young man, Sidney, is then accused of embezzlement at the Washington Embassy, and Daniel is nominated to represent the hapless man in court. But Daniel senses there is more than a minor matter of alleged embezzlement - £100 which could have been paid back by Sidney and then summary dismissal from government service would serve the purpose. Carefully picking his way through family loyalties, the Thorman's protective instinct to their daughter, government secrets and the promise of his own career, Daniel finds the truth hidden behind the attack in America, two murders, a pile of forged paperwork and old secrets. When Daniel’s sister and her husband arrive for a visit from Washington, DC, Daniel is excited to meet his brother-in-law, Patrick, and his two nieces for the first time. Daniel is pulled aside by his brother-in-law, a policeman in DC, and told of a violent attack on a young woman by a British citizen who escapes to the British Embassy and claims diplomatic immunity. Daniel is outraged that the perpetrator, Phillip Sydney, has gotten away with the crime and agrees to help in any way he can short When Daniel’s sister and her husband arrive for a visit from Washington, DC, Daniel is excited to meet his brother-in-law, Patrick, and his two nieces for the first time. Daniel is pulled aside by his brother-in-law, a policeman in DC, and told of a violent attack on a young woman by a British citizen who escapes to the British Embassy and claims diplomatic immunity. Daniel is outraged that the perpetrator, Phillip Sydney, has gotten away with the crime and agrees to help in any way he can short of framing Sydney of a crime on British soil. Later, Daniel is forced to defend Sydney in court and isn’t sure he has the whole story. He teams up with Miriam Blackwood, a physician and pathologist, to figure out what is going on only to find that the necklace Sydney stole in America may have lead to a murder. While this is the second book in the Daniel Pitt series, it reads like a stand-alone. Perry gives her readers enough information about the ongoing characters so they will not feel as if they are lost. This is the second book in this book series and it's just as entertaining as the first book. Daniel is thrilled when his sister Jemima, who lives in America with her husband and two small children, returns to London for a visit. He quickly finds out, however, that Jemima's good friend Rebecca was recently attacked in Washington, D.C. and a cherished family heirloom taken. Rebecca's family has accused a young diplomat, Sidney, of the attack. Sidney looks particularly guilty because he claimed diplomatic immunity and fled the country. Rebecca's family has also turned up in London and is pressing prosecutors there to charge Sidney with another crime in England so that her accusations can be brought up. Daniel is asked to defend Sidney and help the accusations come to light, but once he begins his investigation, he gets the feeling that he's not being told the whole story. Daniel enlists the people that helped him in his previous case to assist, and is determined to get to the truth. The story is well-written and fast paced. While I figured out the "truth" before the ending, it took me awhile to get there. My only complaint is that the ending was quite abrupt and there was nothing added after the mystery was solved. In the second installment of the Daniel Pitt series, Daniel’s sister is home from America for a visit with her husband and two daughters. His American brother in law, Patrick has brought a case along with him. When a young American socialite is attacked and robbed by an employee of the British embassy the man flees back to England under the guise of diplomatic immunity. Not only have Jemima and her family come for a visit, so has the young woman who was attacked, along with her family. It seems t In the second installment of the Daniel Pitt series, Daniel’s sister is home from America for a visit with her husband and two daughters. His American brother in law, Patrick has brought a case along with him. When a young American socialite is attacked and robbed by an employee of the British embassy the man flees back to England under the guise of diplomatic immunity. Not only have Jemima and her family come for a visit, so has the young woman who was attacked, along with her family. It seems that the attacker is now being charged with embezzlement and Daniel is asked to defend the man so that they can also charge him for the assault and robbery. As Daniel commits to defending the man on the embezzlement charges, he comes to believe the man is not only innocent but being set up for something much larger. As tempers flare and accusations of protecting ones own countryman come out, Daniel knows he must do the right thing..no matter who is right or wrong, justice must be served. Enjoy this series and we get another visit from Doctor and Pathologist Dr Miriam, a strong character for such an era in time. Overall, you will find yourself wondering who did it, then wondering why they did it and then seeing how the clues were there all along. A great whodunit in a Victorian England setting.